Lisa Houck has been teaching Japanese Woodblock Printmaking and Mosaics workshops through Continuing Education for over ten years. Her studio practice is located in Boston's South End, where she works in a variety of media including mosaics, ceramics, watercolor, oil on wood and printmaking. Additionally, Lisa has enjoyed taking classes at MassArt to learn new techniques and to add to her existing skill set. For the past several years, Lisa has been taking Clay Studio with Professor Janna Longacre. She loves "the way that MassArt offers [continuing educations students] the same access to the school that day students have." So that she can spend as many hours as she wants working on her clay projects. Lisa welcomes the "opportunity to be with students of all ages and to immerse myself in art school as I did back in my undergraduate days." 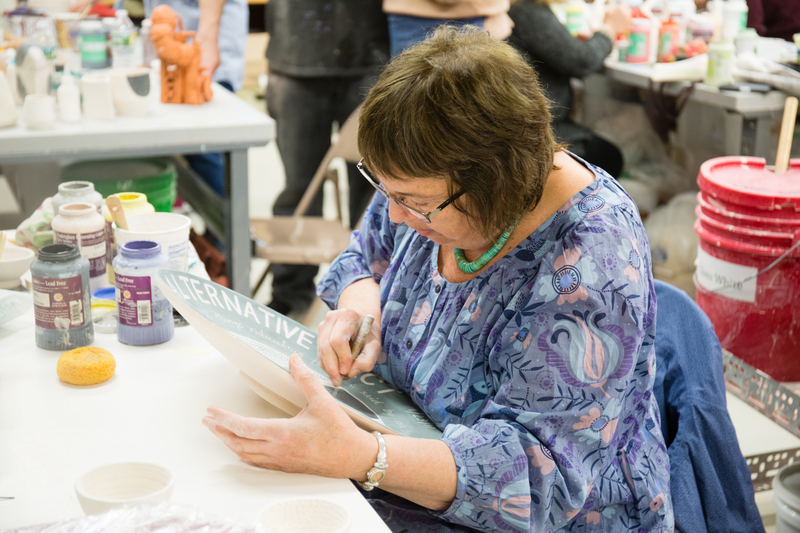 She reports that "the facilities in the ceramics department are amazing, and I can experiment with different kinds of clay and different firing temperatures…It has been a wonderful part of my week to go to class on Tuesday nights and get immersed in making ambitious pieces out of clay." This semester, Lisa made a series of plates with highlights from Donald Trump’s presidency. Lisa recalls, "He was elected during the evening of one of my ceramics classes at MassArt. If you look at ancient history, the way we learn about cultures is by looking at their pottery shards. I thought I should record the history of this period so we would never forget...Making these pieces helps me cope..."